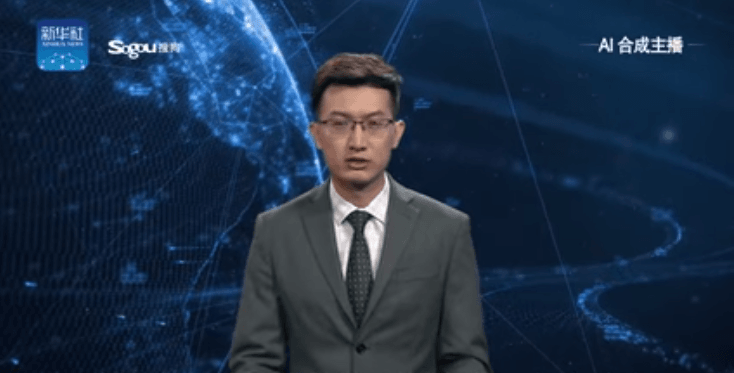 If you live in China or closely follow Chinese news, don’t be surprised (or shocked) if you see an AI anchor presenting the news. China’s state-run news agency Xinhua has introduced new AI news anchors at the ongoing fifth World Internet Conference in Wuzhen. The so-called “composite anchors” combine artificial intelligence (AI) technology with the voices and images of human anchors. They read news using synthesized voices. Xinhua’s new anchor takes the shape and appearance of a human anchor to read out news stories for viewers. The lip movements look quite realistic and the machine’s facial expressions are minimal. In the video below, the English anchor introduces “himself” as who he is and what his capabilities are. His voice and face is based on Xinhua’s news anchor Zhang Zhao. He is capable of reading news as it is typed out in the teleprompter. The English AI anchor assured viewers that he would “work tirelessly” and deliver news without any interruptions. The Chinese news agency said in a statement that its AI anchors will collect data from live broadcasting videos and other sources and learn to develop themselves. Xinhua claims the AI anchors can “read texts as naturally as a professional news anchor.” There is also a Chinese-language version of the anchor. The state-run news agency said each anchor could “work 24 hours a day on its official website and various social media platforms, reducing news production costs and improving efficiency.” They will deliver news with “the same effect” as human anchors because the machine learning algorithms can synthesize realistic-looking facial expressions, lip movements, and speech. The news outlet added that the AI anchors have now “officially become” members of its news reporting team. They will be working with other anchors to “bring you authoritative, timely and accurate news information in both Chinese and English.” They will allow the agency to reduce costs while generating news reports for TV, website, social media, and other platforms. Xinhua developed the AI anchors in collaboration with Chinese search engine firm Sogou. It is unclear how the underlying technology works. The news agency appears to have taken footage of news anchors as a base layer and then animated the mouth and face to turn the anchor into a “virtual puppet” with a synthesized voice, speculates The Verge. Though Xinhua described it as a “breakthrough,” the AI anchor still has certain limitations. It (or he?) reads out news in a monotonous and boring manner with little to no expressions. The anchor also acknowledged that the AI technology is still in development and it needs many improvements. In the video above, you’ll notice that the voice is artificial. Even Google Assistant sounds far more natural than this news anchor. However, machine learning technologies have been developing rapidly. We wouldn’t be surprised to see this AI anchor become more natural and present news in a more human-like manner in the near future. It is too early to say how the deployment of AI anchors to present news across TV, web, social media, and other platforms would play out, especially in China where media is heavily censored. The AI anchors could be used to suppress critical news and spread propaganda on a massive scale.